At Maghull Radio, we put the community at the heart of everything we do. It's about our valued listeners, our volunteers who make the station happen, heartwarming stories of local champions, people having fun together at our community events and the partners who support us. 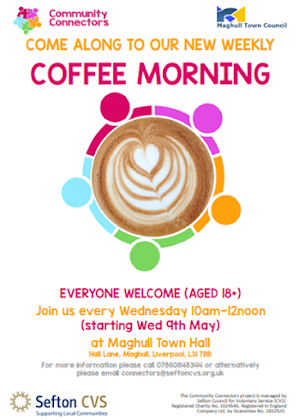 To get your community group, organisation, activity, event or any local news featured on The Community Hour, please email studio@maghullradio.co.uk We love speaking to local people too, so if you'd like to be interviewed about your group, event or news story, please get in touch. Have an event you would like us to list on our website? Then fill in the form here and we can get that sorted for you, alternatively, you can email studio@maghullradio.co.uk. The event is expected to clear between 16:00 and 16:15 on 19 April 2019.